How much do you value the life of another person? Most of us are quick to help, or to call 911, whenever we see anyone in a life or death struggle. 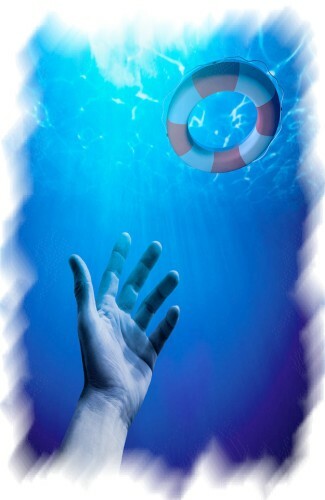 Especially around bodies of water, I've seen people respond heroically to cries for help... by tossing a lifebuoy, a rope, or even plunging in, to pull a drowning victim to safety. Similarly, each day you likely come in contact with dozens of people who are drowning without Christ in their life. For them, its only a matter of time until they will perish, unless a believer like you, who understands the life-saving of Christ, will respond and extend the lifebuoy of the Gospel that can save their soul from death. Christ is the Only Answer! The Bible tells us that any person who dies without their name written in the book of life, will spend all of eternity in the lake of fire. ...anyone not found written in the Book of Life was cast into the lake of fire (Rev. 20:15). And the only way anyones name is added to that book is by putting their faith in Jesus Christ as their Savior and Lord (Rev. 21:27). The scriptures tell us that Jesus is the ONLY way that anyone can be saved (John 14:6, Acts 4:12). So this means that all those without Christ will be destined to suffer endless torment in the unquenchable flames of Hell forever, and ever, ...into the fire that never shall be quenched (Mark 9:43). However, the great news of the Gospel is that God doesn't want anyone to be lost, and jhas provided a plan of reedemption. The Lord is... not willing that any should perish but that all should come to repentance (2 Peter 3:9). This is why He sent Jesus to become a sacrifice for the worlds sins (John 3:16). However, who is going to tell them about this life-saving news? Who is willing to throw them the life-preserver that can save their life from the horrible consequences of eternity in the lake of fire? ...how shall they believe in Him of whom they have not heard? And how shall they hear without a preacher? (Romans 10:14). The responsibility of delivering the life-saving Gospel to the lost has been committed to all believers. Thats right, ALL believers, not just ordained ministers, evangelists, or missionaries. In fact, the Apostle Paul said that the ministry of reconciling people to God has been given to all those who have been born-again, whose old life has passed away, and all things have become new. ...if anyone is in Christ, he is a new creation; old things have passed away; behold, all things have become new. Now all things are of God, who has reconciled us to Himself through Jesus Christ, and has given us the ministry of reconciliation (2 Cor. 5:17-18). Christians must understand that this is a very serious responsibility. It is a matter of life or death! The consequences of what we do may determine the eternal destiny of our friends, family, or acquaintances. There are individuals who may spend eternity in Heaven with Christ because we told them about Jesus Christ. And even more sobering, there may be those who suffer eternal torment in the lake of fire FOREVER, simply because we couldnt find the time or were too embarrassed to talk about Jesus! Dear believer, was Jesus embarrassed of you when He hung on the cross with blood spurting from every part of His body? Did Jesus have a problem finding time to suffer for you, as He dangled for hours, nailed to a brutal, splintery cross? Of course not. And neither is there any excuse for any believer who tries to justify their apathy for the lost! It certainly is not your responsibility to tell the whole world about Christ. But it is indeed your duty to tell your world, those you live with, who you work with, or your friends and family (Mark 16:15). You are their missionary that God has sent to them, and its very possible, you may be the only opportunity that some may ever have, to hear the message that could save their life. And if you decide not to say anything, not to warn them, to do nothing, the Bible says that their blood could be on your hands for eternity (Ezek. 3:18-19). Jesus was not ashamed to suffer and die for us, let us neither be ashamed to share His life-saving message to the lost! Thats all He asks. Just share His message. For whoever is ashamed of Me and My words, of him the Son of Man will be ashamed when He comes in His own glory, and in His Fathers, and of the holy angels (Luke 9:26). (1) Live an honest and Godly life, daily, before your family, friends, and co-workers, as a good witness and testimony of Jesus. Your efforts to share Christ will have little effect unless they are backed up by a godly, wholesome lifestyle. (2) Memorize or mark verses in your Bible relating to salvation, and equip yourself with tracts, literature, or invitations to Church that you can distribute or leave in conspicuous locations. (3) Yield your life to the Holy Spirit daily, and pray fervently that the Lord will cause your path to cross with someone whose heart will be open to the message of Christ. (4) When the opportunity arises in casual conversations, share your testimony of how you found Christ. If you sense their heart is open, or when they continue to ask questions, go further and invite them to pray and to accept Jesus. Invite persons to Church where they can hear more about salvation and how to serve Christ. This article (VL-135) is copyrighted © by Dr. Dale A. Robbins, 1990-2019 and is a publication of Victorious Publications, Grass Valley, CA - Nashville, TN. Unless otherwise stated, all scripture references were taken from The New King James Bible, © Thomas Nelson Inc., 1982. You may download this article for personal use as long as you retain credit to the author. Obtain permission before reproducing copies for any reason, by filling out our simple use permission form. Many of our writings are also available as free pdf tri-fold pamphlets, which can be downloaded for reproduction from our Online Catalog. For media reproduction rights, or to obtain quantities of this title in other formats, email us. If you have appreciated these online materials, help us reach the world with the Gospel by considering a monthly or one-time tax-deductable donation.